Throughout life, a person’s mental faculties are in a constant state of change. For example, mathematicians reach their maximum mental productivity in their 3rd decade. Most people begin to experience very gradual decline in mental abilities as a normal part of healthy aging. Normal age-related changes in cognition are in part due to the limited capacity of the brain’s nerve cells to regenerate. Indeed our brains become smaller with age. However, after our seventh or eighth decade, an accelerated loss of mental function may signify onset of dementia or less severe abnormal cognitive decline. 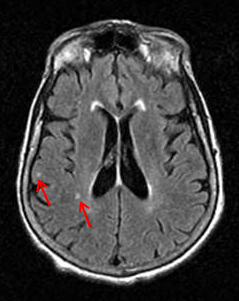 Ischemic tissue damage (marked by red arrows) indicates the presence of silent strokes in the brain. Both white matter disease and silent strokes have been linked to chronic high blood pressure. Alzheimer disease is the most common cause of dementia. Scientists around the world are studying how brain cells age and the biologic changes that underlie Alzheimer’s disease. This research may someday lead to powerful new treatments to prevent or slow Alzheimer’s disease. The second most common dementia diagnosis is vascular dementia, which is caused by widespread stroke damage, called infarcts, in the brain. Vascular dementia usually occurs due to the cumulative impact of multiple strokes, including small infarcts which occur unnoticed over time. About 20 percent of the blood circulating through our bodies enters the brain where a highly intricate network of blood vessels distributes oxygen and nutrients to billions of brain cells. When high blood pressure pounds vulnerable brain blood vessels year after year, those vessels become scarred, narrowed and diseased with arteriosclerosis. This can cause ischemic stroke damage due to lack of adequate blood flow and also upset the delicate balance between the nerve cells’ need for nutrients and what the bloodstream can supply. The most well-known consequence of uncontrolled high blood pressure is stroke, and for decades scientists have known that stroke increases the risk of developing dementia. The good news is that you can prevent stroke by controlling your blood pressure. In fact, a 10-point reduction in systolic blood pressure can result in a one-third reduced risk of stroke risk. Moreover, some scientists believe that the hypertension-related changes in brain blood vessels that contribute to stroke also make people more vulnerable to Alzheimer’s dementia. Decades of scientific study have shown that controlling high blood pressure reduces the likelihood of vascular disease. This science offers promise that we may be able to reduce the risk of cognitive decline and dementia by employing what we already know about preventing stroke. High blood pressure may increase the risk of cognitive impairment. Numerous epidemiological research studies have documented that high blood pressure, especially in midlife, is associated with accelerated impairment of brain activity later in life. Many researchers believe that long-term damage to the blood vessels in the brain compromises the supply of nutrients to the areas that are critical to our ability to think, reason, and make decisions. In addition to structural changes within the vessels, the high blood pressure leads to cellular and molecular dysfunction in the brain tissue. The accumulation of these negative effects over time may impair our brain’s ability to carry out cognitive tasks. Studies have demonstrated an association between high blood pressure and lower measures of global cognition as well as poorer performance on tests that measure executive function (our ability to plan and make decisions) as well as our brains’ processing speed. This contrasts somewhat with the typical short term-memory trouble of Alzheimer’s disease. Since these effects occur due to sustained exposures over time, controlling blood pressure in middle age, decades before most people become concerned about age-related cognitive loss, maximizes the potential for protecting brain function later in life. Brain scans reveal subtle brain damage that is linked to hypertension and impaired cognition. Changes in the brain’s white matter – the tracts that carry signals between brain regions – can be seen on MRI scans as a result of small blood vessel disease deep in the brain. Image courtesy of Anand Viswanathan, M.D. Changes in brain structure can be seen on MRI scans in the majority of elderly individuals. Scientists have been trying to understand the causes and consequences of these changes in the bundles of fibers that connect brain regions. Called “diffuse white matter disease” it appears on MRI brain scans as coalescing, multiple bright spots in deep structures of the brain. Disease in the small blood vessels that supply the center of the brain contributes to these changes. These abnormalities are prevalent in elderly populations, affecting as many as 80 percent of those over age 80, but their number, size, severity and rate of progression vary. Research has demonstrated an association between these white matter lesions and blood pressure levels, with higher blood pressure levels over time being linked to more extensive areas of white matter damage. Some studies also suggest a link between severe white matter lesions and diminished performance on tests of cognitive function. Another type of subtle brain damage is the “silent” stroke. Silent strokes (or infarcts) show up as multiple areas of ischemic tissue damage on MRI scans or in brains examined after death. In contrast to strokes that cause immediately obvious consequences, silent infarcts go unnoticed because they are so small, or because they occur in areas that are not directly responsible for movement, speech, vision, or other obvious behaviors. These silent infarcts increase in prevalence as we age affecting as many as 30% of elderly individuals. 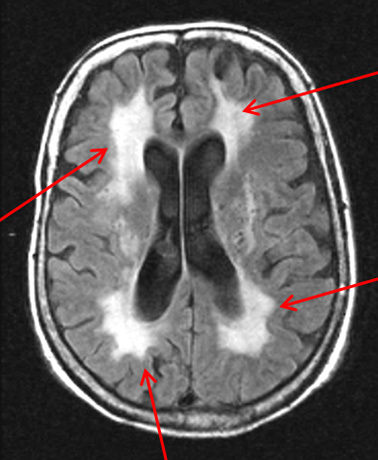 Like white matter lesions, silent infarcts can vary in size, quantity, and location. A strong body of evidence links these silent infarcts to high blood pressure and suggests that they contribute to cognitive impairment and dementia. In addition, microscopic strokes, which are not visible on MRI but can be detected with microscopic brain tissue examination during autopsy, are even more prevalent and have also been linked to poorer cognitive function and dementia. High blood pressure may increase the risk for dementia. Dementia is a clinically diagnosed condition characterized by significant, sustained decline of overall mental abilities that is severe enough to interfere with normal daily activities. The most commonly diagnosed dementia is Alzheimer’s disease, and the second most common diagnosis of dementia is vascular dementia. Epidemiologic studies have documented an association between high blood pressure and other cardiovascular risk factors in midlife with the onset of dementia at later stages. Data from randomized controlled trials of different blood pressure medications seem to suggest that controlling blood pressure limits cognitive decline and dementia, but these studies are inconclusive because it is difficult to design studies that address the question in a definitive way. For decades research has shown that dementia risk strikingly increases in the years after a stroke, but exactly why this occurs remains a mystery. Moreover, population-based autopsy studies have shown that most patients who die with dementia often have a combination of both Alzheimer’s pathology and brain injury due to vascular disease or silent strokes, so called “mixed dementia”. Experts now believe that the processes that give rise to vascular disease in the brain and Alzheimer’s disease may converge, dramatically increasing the likelihood and severity of dementia more than either condition alone. Ongoing research is exploring the biological mechanisms that underlie the relationship between high blood pressure and other cardiovascular risk factors and development of dementia. Over the past 5 decades stroke rates in the US have decreased by 70 percent as blood pressure control has become the standard of care. If there is a link between vascular diseases, including stroke, and dementia then it would be expected that dementia rates should exhibit a parallel decrease. In fact, recently a number of studies have reported decreased dementia incidence rates in the US and other developed countries. Brain health is linked to the health of blood vessels that supply the brain. High blood pressure is the most important risk factor for brain blood vessel disease. High blood pressure has been associated with clinically apparent stroke, diffuse white matter disease and silent stroke on MRI brain images and brain examination at autopsy. These in turn have been linked to cognitive decline and dementia. For many reasons treating high blood pressure and keeping it under control is good for the brain! Gottesman, Rebecca F.; Schneider, Andrea L.; Albert, Marilyn; Alonso, Alvaro; Bandeen-Roche, Karen; Coker, Laura; Coresh, Josef; Knopman, David; Power, Melinda C.; Rawlings, Andreea; Sharrett, A. Richey; Wruck, Lisa M.; Mosley, Thomas H.; Mosley. Midlife Hypertension and 20-year cognitive change: the Atherosclerosis Risk in Communities Neurocognitive Study . JAMA Neurol. 2014; 71(10):1218-1227. Yaffe K, Vittinghoff E, Pletcher MJ, Hoang TD, Launer LJ, Whitmer R, Coker LH, Sidney S. Early adult to midlife cardiovascular risk factors and cognitive function . 2014 Apr 15;129(15):1560-7. Gorelick and Nyenhuis. Blood pressure and treatment of persons with hypertension as it relates to cognitive outcomes including executive function . Journal of the American Society of Hypertension. 2012; 6(5):309–315. Debette S, Seshadri S, Beiser A, et al. Midlife vascular risk factor exposure accelerates structural brain aging and cognitive decline . Neurology 2011;77:461-468. Faraco and Iadecola. Hypertension: A Harbinger of Dementia . Hypertension. 2013; 62: 810-817. Alonso, et al. Risk of dementia hospitalization associated with cardiovascular risk factors in midlife and older age: the Atherosclerosis Risk in Communities (ARIC) study . J Neurol Neurosurg Psychiatry. Nov 2009; 80(11): 1194–1201. Freitag et al., Midlife Pulse Pressure and Incidence of Dementia. The Honolulu-Asia Aging Study . Stroke. 2006; 37: 33-37. Poggesi A et al. 2001-2011: A decade of the LADIS (Leukoaraiosis And DISability) Study: what have we learned about white matter changes and small-vessel disease? Cerebrovasc Dis. 2011;32(6):577-88. Debette S & Markus HS. The clinical importance of white matter hyperintensities on brain magnetic resonance imaging: systematic review and meta-analysis. BMJ. 2010. Van Dijk EJ, Prins ND, Vrooman HA, Hofman A, Koudstaal PJ, Breteler MMB. Progression of cerebral small vessel disease in relation to risk factors and cognitive consequences: Rotterdam Scan Study. Stroke 2008;39:2712–2719. van Dijk et al. The Association Between Blood Pressure, Hypertension, and Cerebral White Matter Lesions . Hypertension. 2004; 44: 625-630. Chen LY et al. Atrial fibrillation and cognitive decline – the role of subclinical cerebral infarcts: the Atherosclerosis Risk in Communities Study . Stroke. 2014. Smith EE, Schenier JA, Wardlaw JM, Greenberg. SM. Cerebral microinfarcts: the invisible lesions . Lancet Neurol. 2012;11(3):272–282. Das RR, Seshadri S, Beiser AS, et al. Prevalence and correlates of silent cerebral infarcts in the Framingham Offspring Study . Stroke 2008;39:2929–2935. Vermeer SE, Prins ND, den Heijer T, Hofman A, Koudstaal PJ, Breteler MM. Silent brain infarcts and the risk of dementia and cognitive decline . N Engl J Med. 2003 Mar 27;348(13):1215-22. I am 69. Twenty or so years ago I was tested and told I was in the 98 percentile. Several years ago I was given part of the same test and was at 80%. I was told I have epilepsy and I was told I do not. What I learned were seizures of differing types I now call events because different doctors have different opinions and some get very emotional about their opinion. Right now I have a sensation like a band around the circumference of my head about two inches above my ears on both sides. I describe it as the top of my head expanding or lifting. Because my cognitive difficulties are interfering with my daily life I would like to find a study related to these questions before I become unable to care for myself. “The Life and Death of a Neuron” led me to this page. I would like to have a copy for my grandson who would like to be a nurse. I look forward to your reply.